The National Spinal Cord Injury Statistical Center (NSCISC) estimates that about 17,500 new spinal cord injury cases occur nationwide each year. While the causes of these catastrophic injuries vary, the victims generally have at least two things in common — physical pain and extensive medical costs. These types of injuries have a devastating impact on injured victims and their families, who are unprepared for the expense of huge medical bills and the challenge of a long and painful recovery process. You and your family members don’t have to suffer in silence when impacted by the physical and emotional trauma of another party’s negligence. The skilled North Dakota spinal injury attorneys of the Larson Law Firm P.C. fight the legal battle to obtain the compensation that you and your family deserve. We aggressively go after responsible parties and hold them liable for the careless and negligent actions that led to your spinal cord injury. You deserve full compensation for all losses related to your catastrophic injuries, including emotional pain and suffering. 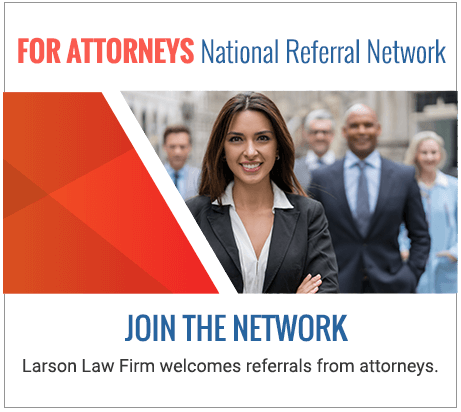 At the Larson Law Firm, our team of lawyers is your staunchest ally, aggressively negotiating on your behalf to get you the fair legal settlement you deserve, or upholding your rights in court during a trial. A spinal cord injury causes damage to the bundle of nerves that runs from the brain through the spine. It can result in full or partial loss of sensation and movement in the body. With minor spinal injuries, surgery and rehabilitation helps patients regain their mobility. However, with traumatic injuries the spinal cord is permanently damaged and cannot be surgically repaired. Our knowledgeable team understands that you face an uncertain future with painful, life-long medical issues. That is why we put all of our knowledge and skill into pursuing compensation on your behalf. A permanently disabling spinal injury drastically affects your quality of life forever. It robs you of your ability to work and financially provide for your family. At Larson Law Firm P.C., our legal team fights for you and your family with the same commitment we would have for our own loved ones. We assist spinal cord injury victims from our office in Minot, but we also serve clients from Ward, Williams, McKenzie, Pierce and Mountrail Counties. Call us today at 701-484-HURT or complete our contact form to schedule a free consultation.